It's a giant environmental hazard, getting worse by the hour. 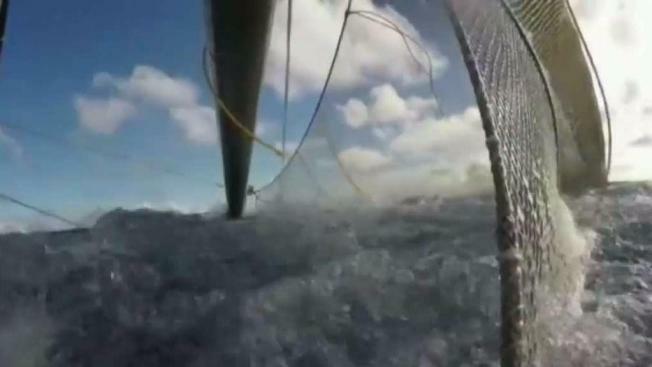 On Wednesday, NBC Bay Area got a first-hand look at how a Bay Area company wants to tackle the "Great Pacific Garbage Patch." Scott Budman reports. A Bay Area nonprofit has high hopes for tackling the so-called Great Pacific Garbage Patch, which features 80,000 tons of floating plastic. Alameda-based foundation The Ocean Cleanup is building what it hopes will be a trap for 1.8 billion pieces of plastic polluting a remote area in the Pacific Ocean between California and Hawaii. "For 60 years, man has been putting plastic out into the ocean," Ocean Cleanup CEO Boyan Slat said. Researchers with The Ocean Cleanup estimate the Great Pacific Garbage Patch covers more than 600,000 square miles, more than 3.8 times the size of California. The environmental group plans to use dozens of connected floating tubes with netting attached that will spread out in a U shape near the garbage patch. "The sooner we get it out, the better," Slat said. "Because it's kind of this ticking time bomb." The Ocean Cleanup hopes to start holding test runs in July.